For those of you who have been waiting anxiously for my return to THEI or if you did not even realized that I have been AWOL from posting for awhile, I just want you to know – like a bad penny. . . I’m back! Hello old fiends and new. I was off-line for almost 2 years as I positioned myself off-grid as much as possible. Well, off grid on everything except for my presence on this devil’s machine. But now I’m here again and will – once again – be keeping you informed of what’s happening in the world of THEI. And I’ve coxed Rick back also (although he might not realize it yet). 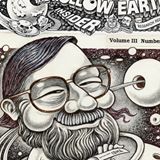 For those of you who don’t know me … I have researched and edited “The Hollow Earth Insider” since I sent out my first fanzine of the same name back in 1992. I also helped create & was host of ( with my partner Rick Osmon) the very popular “Unraveling the Secrets” radio and television shows on the internet back in the days of early radio and TV on the internet. I am now assembling and writing my next book – working title The Hollow Earth Insider: Subterranean Realms Research Final Report and need you guys help. I have created “Dennis Crenshaw’s Hollow Earth Insider Research Forum” on Facebook and would like those of you interested in joining such an endeavor to stop in. This is NOT a ‘general information’ HE forum, but will concentrate on those areas of specific study that I will designate. The first Forum research subject, Admiral Byrd’s Lost Diary has been posted. Join me if you have any info etc. on the subject. Or just stop in and keep up with our research into this and all the different aspects of the subterranean realms and give us a bump. Next Report in this series: Continuing our research into the strange mysterious explorations of Admiral Richard E. Byrd.